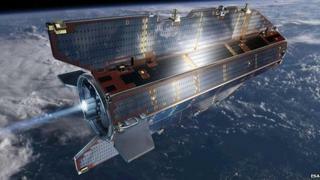 The European Space Agency's (Esa) Goce satellite has re-entered the Earth's atmosphere, burning up in the process. US tracking data suggests any surviving debris fell into the South Atlantic, just off the tip of South America, south of the Falkland Islands. Dubbed the "Ferrari of space" because of its sleek looks, Goce is the first Esa mission to make an uncontrolled re-entry in more than 25 years. The gravity mapping probe's plunge was inevitable once it ran out of fuel. The mission was operating in an extremely low orbit - at 224km altitude, the lowest of any scientific satellite - and needed to constantly thrust an electric engine to stay aloft, but last month its reserves of xenon fuel were exhausted. Pre-return modelling had indicated that perhaps a fifth to a quarter of Goce's one-tonne mass could have endured the fiery fall through the atmosphere. Its sophisticated gradiometer - the instrument used to make gravity measurements - incorporated composite materials which were expected to ride out the destructive forces that would ordinarily incinerate traditional components. The Inter-Agency Space Debris Coordination Committee - the global forum on "space junk" - chose Goce as its special study project for 2013. This meant a large number of tracking and surveillance facilities around the world were activated to monitor the satellite's descent to Earth. A signal from Goce was last acquired at 22:42 GMT on Sunday as it passed 121km (75 miles) above Antarctica. Data from the United States Strategic Command (USSTRATCOM) indicated that re-entry occurred a little over one orbit of the Earth later, with the spacecraft starting to break up at 00:16 GMT on Monday at an altitude of about 80km. This would have put any debris fall in the South Atlantic just east of Tierra Del Fuego. "Goce survived for a few minutes longer than we expected - but since re-entries are difficult to predict, this is not very surprising," Holger Krag from Esa's Space Debris Office told BBC News. Goce's slender, fin-shaped construction, combined with its magnetic attitude-control system, maintained a stable orientation until very late in the descent. Engineers monitoring the last hours of the satellite from Europe's Space Operations Centre in Darmstadt, Germany, observed Goce to keep a straight-on approach as it dipped deeper and deeper into the atmosphere. "This was due to the shape of Goce, which was designed in such a way that it was aerodynamically stabilised," said Dr Krag. Statistics show that there is typically at least one piece of tracked space "junk" re-entering the Earth's atmosphere every day; with, on average, one intact defunct spacecraft or old rocket body coming back every week. Esa's last mission to make an uncontrolled re-entry was the magnetosphere explorer Isee-2, which came back in 1987. The agency does, however, regularly manage controlled re-entries. Its space station freighter, the Automated Transfer Vehicle, can weigh some 13 tonnes when it comes back to Earth. It has fuel and thrusters to direct its destructive dive towards the vast and uninhabited waters of the Southern Ocean, east of New Zealand. Goce (Gravity Field and Steady-State Ocean Circulation Explorer) was launched in 2009 as part of a series of innovative environmental research satellites. Its super-sensitive gradiometer was used to detect the tiny variations in the pull of gravity across the surface of the Earth. Its maps have very broad applications. The data is a key reference in civil engineering for relating heights measured at widely separated locations, and for the computer models that need to understand how the oceans move to forecast future changes in climate.